New! We've added our jewelry style collar tags to a color matched adjustable collar to fulfill your pet's identification needs with one easy solution, and at a price you can't beat! Our ID collars are silent, chew proof and easy to manage. 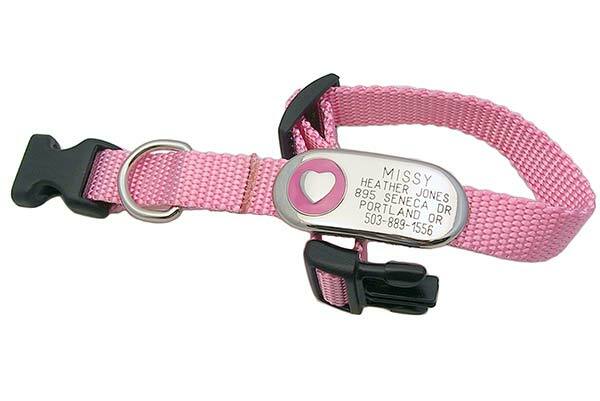 Featuring an adjustable nylon collar with a quick release (not breakaway) buckle and a color matched enameled jewelry tag attached to lay flat against the collar. The tags are held in place by an ultra thin Velcro-like fastener that opens and closes to go around the collar. Available in Red, Blue, Pink, Purple and Black, and with a paw, heart, flower or bone design. We have three sizes: small sizes 3/8" x 6-9" or 8-12", medium sizes 5/8" x 8-12" or 10-16", and large sizes 1" x 12-18" or 1" x 18-26". Please note - we found that the Red nylon can bleed color if it gets wet, so we do not recommend Red on white fur. To see the tags or purchase them separately, click here. **Small is Limited to 5 lines of text. For small, please only fill in up to 4 lines if signing up with Owner Alert.